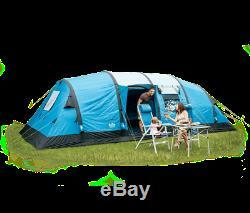 Royal Atlanta Air 8 Berth Tent With Groundsheet And Carpet. The Atlanta Air 8 Person Tent utilises air technology creating a high quality, thoroughly modern air tent for your family camping trip. This tent is made from a flame retardant 150D polyester flysheet with protected zips and taped seams to ensure it is protected from wear and tear, it also has a high waterproof column of 4000mm hydrostatic head. To bring in plenty of light, it has large windows for enhanced visibility. With a manageable weight of 28.6kg and a much smaller packed size, this tent is also easy to transport and store. ROYAL ATLANTA AIR 8 BERTH TENT. 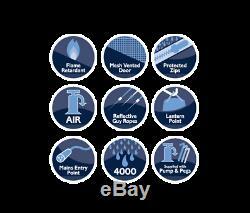 150D polyester Oxford flysheet with taped seams. 10cm air system with individual inflation points. Inner tent 180T polyester breathable. Mesh doors and ventilation panels. Large windows for enhanced visibility. Covered entrance doors for protection against the elements. Reflective guy ropes with storage, pump and pegs included. H 215cm x L 740cm x W 310cm. ROYAL ATLANTA AIR 8 FOOTPRINT GROUNDSHEET. Keeps the bottom of your tent clean and dry. Adds another layer of insulation to trap the warmer air and prevent heat loss. Prevents abrasion to further protect the tent. 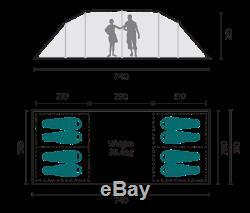 Made to measure and will fit perfectly under tent model. L 740cm x W 310cm. ROYAL ATLANTA AIR 8 TENT CARPET. Designed to colour co-ordinate with the Atlanta tent model. 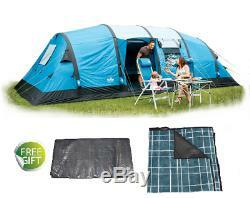 Fit perfectly on the groundsheet to enhance the comfort within your tent. Made from polyester flannel to ensure maximum comfort. With a PVC backing to keep out moisture. For use with Atlanta 8 Tent. L 275cm x W 284cm. Naturally we hold a full range for all services, gas, water and electrical components, from gas/water heaters - the Propex and Truma collections - the complete CBE electrical charge and distribution system with all accompanying switches/sockets/matching frames and should you wish an alternative, the Zig range of electrical appliances. We also carry allied gas/electrical and water fittings. With regards to the kitchen, we offer a great selection of equipment - fridges, hobs, grills, cookers and sinks from leading manufacturers Smev , Cramer , Thetford / Spinflo , Dometic and Waeco. For the bathroom we have cabinets, basins and shower trays, swivel/bench toilets and Thetford cassettes, assorted porta potties and obviously we have water tanks/pumps, and fresh/waste water carriers. We hold Comet & Reich taps and brand names such as Fiamma , Aquaflow and Whale. Now to the exterior of your vehicle - why not finish it off with a superb Fiamma Awning, in a variety of colours and sizes to suit your requirements and what about a cycle rack, to carry those all important bikes? As well as catering for the motor vehicle side, we also have a full range of leisure products for camping -watersports - even for the Skiers amongst you! Carrying ranges from brand leaders Trespass , Coleman , Sevylor , Gelert and Royal. If you would like to have a chat about any of the above items or have any general enquiries please send us a message on. We will be only too pleased to help! Any items being sent via courier to Northern Ireland, Isle Of Man and any other Uk offshore addresses are subject to an additional charge. The item "ROYAL ATLANTA AIR 8 PERSON TENT & CARPET & GROUNDSHEET camping family large" is in sale since Friday, December 7, 2018. This item is in the category "Sporting Goods\Camping & Hiking\Tents & Canopies\Tents". The seller is "grasshopperleisure" and is located in wisbech, Cambridgeshire. This item can be shipped to United Kingdom.